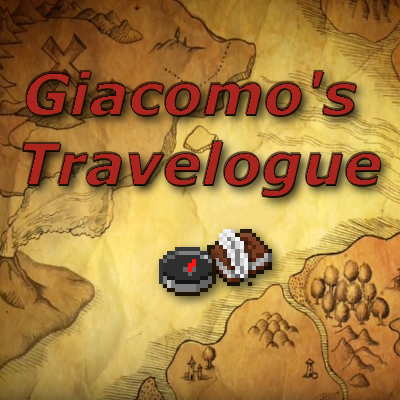 This mod adds a new book titled Travelogue. It keeps track of explored biomes and required biomes to get the achievement "Adventuring time". Every time the author opens it, it is updated with the author biomes lists. Other players can read but cannot modify the book. For those that are wonder, the travelogue does show up in JEI, but it's not easily searchable. The book looks much like any vanilla book and searching for "Giacomos" doesn't yield any results (atleast from my memory). The travelogue should show up if you search JEI for "travelogue". In other words, yes it's there and can be crafted, it's just harder to find in JEI. Hi! Great mod idea. We're going to use it as one of the key bits of an exploration modpack. I've installed the mod and it works when crafted (does not show up in JEI though) but there are a lot of small boxes in the book that say [cr] at the end of the line. Maybe some formatting has changed and this is now longer required? I imagine it's a pretty easy fix. could you post a screenshot plz? On which operating system does the server run? and the client? This is in a singleplayer testing world, but I intend on using it on a server after testing. I am running Windows 7 Pro 64-bit and the server likely will be on the same OS. To test I also tried running with Travelouge as the -only- mod with the same Forge version and OS and the [cr] symbols still show. I'm thinking it might be something to do with Biomes O Plenty since I don't think modded biomes are compatible. cool mod. could be improved by quests, bosses, structures and npcs. I'm gonna check to see if it recognizes modded biomes.